In the hills overlooking Montego Bay, Jamaica, a jungle of lush greenery and fruit trees including ackee, coconut and breadfruit, kiss the edge of a shallow river. Serene and filled with unspoiled beauty, the land resembles paradise, but it’s actually called Montego Bay Gardens. 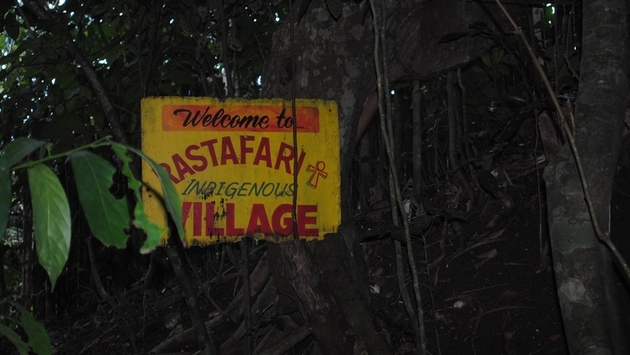 It’s here that divides the conventional Jamaican community of bustling shops and houses with the other side of the river and a place called Rastafari Indigenous Village. 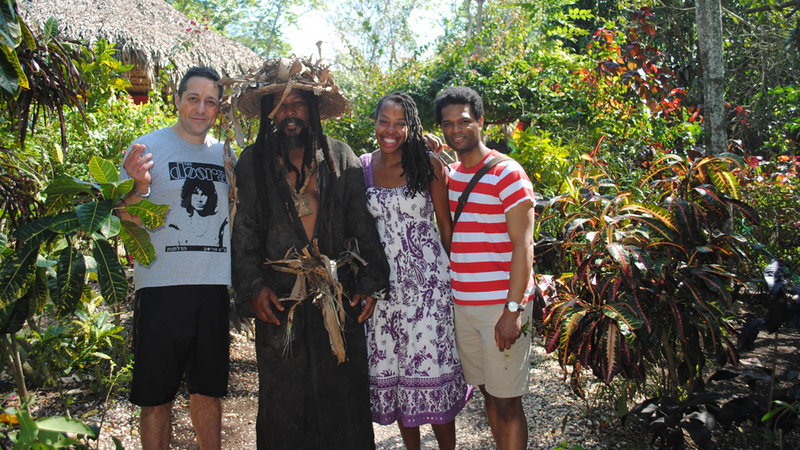 I stepped through the garden and down a hill to a pebbled path as our guide Arlene instructed our visiting group to take off our shoes to cross the river and transition into the Rastafarian community. “When you cross the river, you’re crossing into a different community and way of life,” she explained. Indeed, one of the main purposes of the village’s community tourism imitative is to shed light on the misunderstood Rastafarian lifestyle. The Rastafarian religion has long been linked to Jamaica, from its inception as an African centered political movement on the island in the 1930s, to its modern imagery of dreadlocks and ganja. 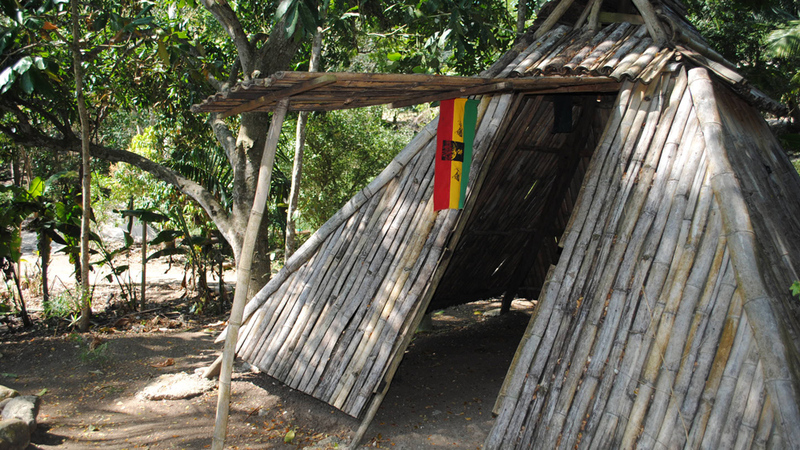 Visitors to Jamaica are often confused about whom and what constitutes a rasta but the Rastafari Indigenous Village is helping dispel the myths. An interactive, eco-cultural experience that includes Jamaican history, culinary demonstrations and musical interaction, the village enlightens visitors about Jamaica and Rastafari. "If you don't understand the context of the social issues and struggle for identity in Jamaica, you can't dance to the music of Bob Marley and know what he's talking about," she said. Clothed in a flowing rose-colored dress, her spine-gracing locks wrapped in tan cloth, Arlene guided us across the river's clear waters. 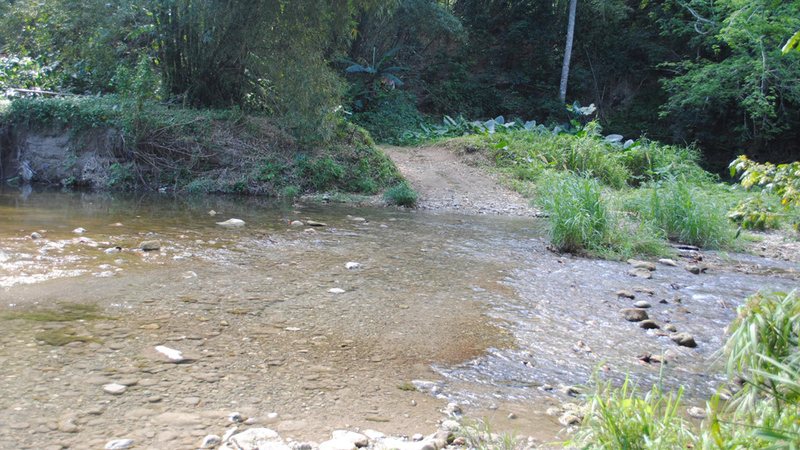 The water flowed up to our ankles and stones scattered across the bottom make the river journey a slow and careful process, similar to the development of Jamaica's Rastafarian community. According to community experts, Rastafarians suffered harsh discrimination throughout the Caribbean; routinely abused and arbitrarily arrested, until very recently. Their belief that the late Ethiopian emperor Haile Selassie is God poses an unacceptable position in the staunchly Christian region. This, coupled with the treatment of marijuana as a sacred herb used for ceremonial ritual, has resulted in the community often being relegated to disdained outsider status in Jamaica. The tide appears to be shifting, and acceptance of the Rastfarian lifestyle has spread globally and particularly in Jamaica. Although still just a tiny segment of Jamaica's population, recent census figures show about a 20 percent increase of Rastafari community members over the last decade. Despite the increase in numbers, programs that allow visitors into the traditionally insular community which rejects the customs and materialism of Western "Babylon" society are unusual. "We broke tradition to open up to visitors," acknowledged Arlene. "Interaction with Babylon is not typical. The tourism is not the end result for us. It's the funding from the community tourism that is helping us build a museum, cottages and a wellness center." With this rare glimpse in mind, Arlene stressed reciprocal interaction; photos of the natural beauty are encouraged but not single photos of community members. Visitors are invited to join members in photos so that it's not a one-sided experience. Crossing over to the other side of the river, a grove of trees and native plants greeted us. Interaction with nature began as we're given leaves to smell from the aromatic bay rum tree and our faces were painted with red streaks from the annatto spice plant. We fingered seeds from the castor oil plant, which are supposed to swiftly clean you out internally. Walking further past banana trees and grazing goats, we reached the entrance of the village, surrounded by a bamboo fence. "Aye, aye, everybody a come," Arlene announced, alerting the community of our arrival. Paintings of Jamaican icons, Black Nationalist leader Marcus Garvey and Nanny, a maroon (a community of escaped enslaved Africans) woman who fought against slavery on the island, line the pathway. As we walked deeper into the village, a demonstration of Rastafarian culinary techniques unfolded in the cooking hut by the village herb master and chef. Native fruits and vegetables covered the counter, forming a brightly colored tapestry. The Rastafarian life process is called ital. ; nothing is killed for food. Eating meat is considered double murder because you're killing the animal and then you're killing yourself by eating it. We sampled fire-roasted breadfruit in banana leaves as we toured simple wooden buildings being constructed for a museum, recording studio, wellness center and guest cottages. Throbbing drumming in the traditional Jamaican kumina rhythm called us to the big hut in the village's center. Community members played bass and nyabingi drums and we were welcomed to remove our shoes and enter the hut to join in. Shaking tambourines, rattling shak shaks and chanting along to the music, we united with the Rastafarian community spirit.